65 year old african american patient post un complicated cataract surgery presents with decreased vision. OCT findings attached. 2. 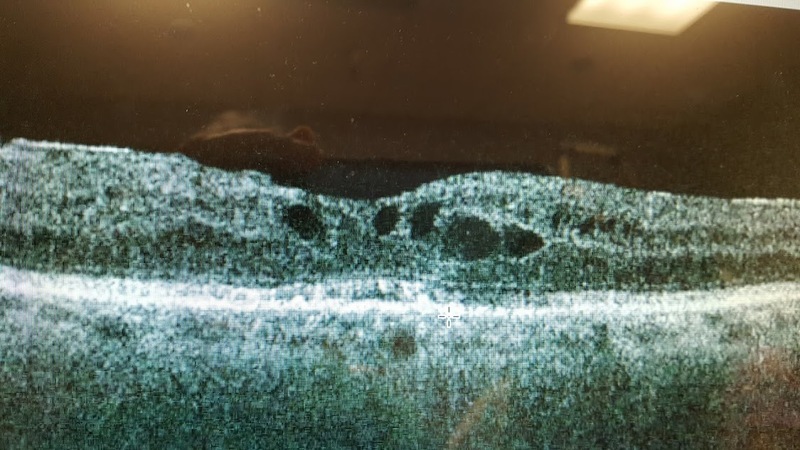 If this patient has underlying Diabetes along with the OCT macular findings, which of the following has better long term prognosis - focal laser vs Intravitreal triamcinolone injection. 3. In example 2, what is the diagnostic test of choice - FA vs OCT? 4. If this OCT apperance is secondary to CRVO, what is the chance of this patients's vision improving with 1 mg of triamcinolone injection vs ranibizumab? No late leakage with FHx of poor vision can be RP or x-linked retinoschisis. Likely RP, so Vitamin A is reasonable, as well as diamox. Even though the CME is next to fovea, would this be amenable to Micropulse laser? If not, then IV injection. FA would be diagnostic to confirm active areas of leakage. Lastly, ranibizumab is preferred in CRVO. 1. CME without leakage with FH of poor vision suggests RP, treatment would start with vitamin A supplementation2. Assuming the leaking microaneurysm can be identified on IVFA, focal laser is preferred over injections. However, this OCT shows central foveal CSME, which is not amenable to laser, thus, intravitreal injections may be necessary. 3. While OCT shows the areas of edema, IVFA is the diagnostic test to confirm leakage. 4. Ranibizumab is preferred over steroids for ME from CRVO.